If you're indignant that your boss just shut the smoking room and outraged that you have to leave the bar to light up, take heart. Life could be worse. You could be Bhutanese. The tiny, trendy Himalayan kingdom recently became the world's first nonsmoking nation. Since Dec. 17, it has been illegal to smoke in public or sell tobacco. Violators are fined the equivalent of $232—more than two months' salary in Bhutan. Authorities heralded the ban by igniting a bonfire of cigarette cartons in the capital, Thimphu, and stringing banners across the main thoroughfare, exhorting people to kick the habit. As if they have a choice. Meddling with an issue as personal as smoking is always tricky, and politicians err at their own peril. Yet Bhutan's ban appears to be sticking and with little public outcry. Even the country's smokers seem resigned to a smoke-free future. "If you can't get it, you can't smoke it," concludes Tshewang Dendup, who works for Bhutan's only broadcaster. He picked up his smoking habit while studying at Berkeley, but says he is now rapidly "downsizing" his consumption. The answer lies not in Bhutan's religion but in its famous quirkiness. This is a country that has elevated contrariness to a national trait. Convention says an impoverished yet stunningly beautiful nation like Bhutan should welcome tourists with open arms—and count the dollars. Yet Bhutan restricts the number of foreign tourists (about 9,000 last year) and charges fees of $200 per day. Convention says that gross national product is the best measure of national progress. Yet Bhutan is aiming for another mark: What it calls "gross national happiness." If Bhutan were a celebrity, it would be Johnny Depp—reclusive, a bit odd, but endearing nonetheless. The Himalayas that surround and engulf Bhutan are a curse and a blessing, cushioning the nation from the shock waves that globalization has generated in other developing countries. The first foreign tourists only arrived in 1974. Television and the Internet are even more novel, having arrived only in 1999. Yet Bhutan largely remains the Shangri-la that wealthy tourists crave. Thimphu is the world's only capital city with no traffic lights. So, having sat out the traditional development rush, Bhutan hopes to steer its own course, avoiding the mistakes of the industrialized world. Because of its homogenous and small population (anywhere from 800,000 to 2 million people, depending on which estimates you believe), Bhutan just might succeed in barring the demon weed. The nation's unusual culture makes a sudden and complete tobacco ban possible. 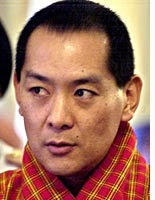 The country is ruled by a benevolent king, Jigme Singye Wangchuk, who is widely revered and universally obeyed. "Bhutanese are pretty happy to sacrifice for their fellow citizen," says Linda Leaming, an American who has lived in Bhutan for the past eight years. "The individual is subjugated to the good of society." It also helps that Bhutan has few smokers compared other nations. Only about 1 percent of the population lights up, according to the health ministry. (Foreign observers believe the actual figure is 3 percent or 4 percent.) Tobacco isn't grown in Bhutan. It is a very small, poor market, and it costs a tremendous amount to import goods. All these are factors that have reduced interest in cigarettes. Yet, even in obedient Bhutan, a few whispers of dissent have cropped up—where else?—on the Internet. "Policy makers wake up," griped one anonymous Bhutanese, writing about the smoking ban on the Web site www.kuenselonline.com. "There is something called personal rights that should be upheld. Educate rather than force or impose." Others worry the tobacco ban will merely encourage a black market in Marlboros. Also others chime in that Bhutan faces more pressing problems than smoking: corruption, alcoholism, and a penchant for doma or betel nut, which Bhutanese chew habitually. Doma, a stimulant that turns your saliva red, has been linked to higher incidence of oral cancer. Bhutan's parliament, which passed the smoking ban, anticipated complaints. It added a few sizable loopholes. Foreigners can still smoke and import tobacco (but if caught selling it to Bhutanese they will be charged with smuggling). Bhutanese are, technically, allowed to smoke in their homes and can even import small quantities of tobacco for "personal use," though they'll pay as much as 200 percent in customs duties and sales taxes for the pleasure.